Since the first water wheel was used in the Middle Ages to provide energy, water and energy have been inextricably linked. The relationship between water and energy has taken on new importance as the number of regions with scarce water supplies has increased. Although water covers nearly three-quarters of the earth, most is undrinkable seawater. Less than 3 percent is fresh water, and only a fraction of that is available for human use; the rest is locked in ice caps and glaciers. Over the last 100 years, global consumption of fresh water has grown at more than twice the rate of the world’s population growth. Pressure on limited fresh water resources is mounting due to increasing population, economic growth and pollution. Water withdrawn is the total volume removed from a water source such as a lake or river. Often, a portion of this water is returned to the source and is available to be used again. Water consumed is the amount of water removed for use and not returned to its source. The pie charts above compare water withdrawal and consumption by industry segments in the U.S. Agriculture is the largest consumer of water. Electric power plants account for more than 40 percent of water withdrawal, but consume only a fraction of that amount. However, water withdrawal data are important, since water availability can impact operations and siting new power plants. Thermal electric power plants, including coal, natural gas, oil and nuclear, represent nearly 80 percent of electric generation capacity worldwide. All thermal electric plants that use steam turbines require cooling to condense the steam when it exits the turbine, and water is by far the most common source of cooling. Once-through cooling systems withdraw large quantities of water, but return most of it to the source. The primary concern with this design is the potential harm to aquatic life near the plant, which can be caused by the mechanisms used to withdraw the water, and the higher temperature of water returned to the source. Closed-loop systems recirculate cooling water and remove excess heat through a cooling tower or pond. Although closed-loop systems withdraw less water than once-through systems, they consume more through higher evaporation rates. Other plant systems, including environmental controls, can also affect water consumption. For example, adding scrubbers on coal plants to reduce air emissions increases water consumption, as will carbon capture and storage technology. Hybrid systems to reduce water use are in different phases of research and development. Water is becoming a strategic issue for the electric industry. Electric utilities are turning to renewable energy, energy efficiency and new technologies – such as integrated gasification combined cycle (IGCC) coal plants – to diversify their energy supply, and these technologies also help decrease water consumption. The industry is continuously looking for ways to more effectively use existing water resources and to create supplemental water storage. A key conclusion from Thirsty Energy: Water and energy should be managed on an integrated basis. And, unlike issues such as climate change that require global solutions, water must be addressed regionally and locally. The four-unit Jocassee Hydroelectric Station, part of the Keowee-Toxaway complex, is a 610-megawatt pumped-storage generating plant located in Pickens County, South Carolina. In the Carolinas, the power plants on the Catawba-Wateree river system and the Keowee-Toxaway complex were planned using an integrated model for water use and energy production. The rivers and reservoirs serve as the backbone of our generation fleet by providing renewable hydropower and cooling water for our fossil and nuclear plants. At the same time, many of the reservoirs also supply public water systems and industrial process water. The Keowee-Toxaway complex includes Oconee Nuclear Station and the Keowee, Jocassee and Bad Creek hydroelectric stations. 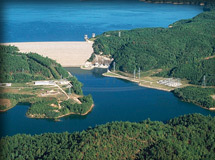 Jocassee and Bad Creek are pumped-storage hydroelectric stations that use the same water over and over again, making more efficient use of water resources. Both plants use two reservoirs to generate electricity: an upper reservoir and a lower reservoir. Water stored in the upper reservoir is released to spin turbines at the base of the dam to generate electricity. The water then flows into the lower reservoir. During off-peak hours, power is used to reverse the turbines and pump water from the lower reservoir to the upper reservoir for storage until later use. The Drought Management Advisory Group, formed as a result of our Comprehensive Relicensing Agreement for the Catawba-Wateree Hydroelectric Project, continued to manage the response to fluctuating water supply levels in the Carolinas in 2008. The group – comprised of Duke Energy, other large water users and several state environmental, geological and natural resource agencies – spearheads efforts to reduce water consumption during periods of drought in the river system. We also continue to collaborate with the Catawba-Wateree Water Management Group, a first-of-its-kind nonprofit corporation formed by Duke Energy and 17 public water system owners along the Catawba. Members are working on a variety of projects as part of a five-year strategic plan to address long-term supply and demand issues. For example, a “smart” irrigation pilot program will explore the use of new technology to better manage lawn watering systems of customers living on company-operated reservoirs.